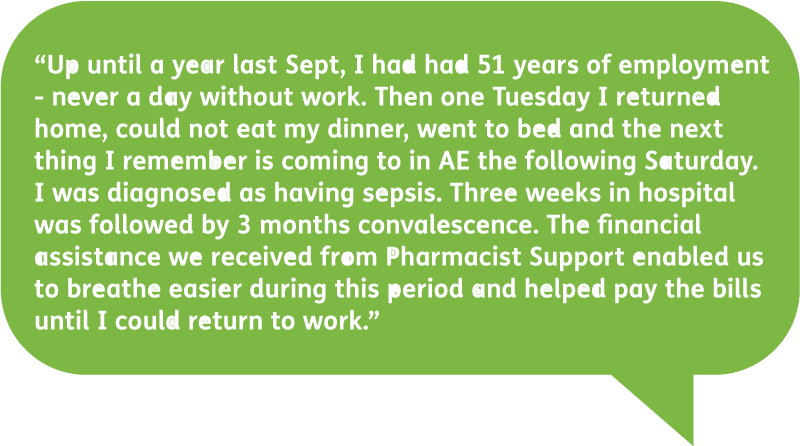 Since relaunching the charity in September 2008, Pharmacist Support has provided almost £2million pounds in financial assistance and secured £10.5 million worth of gains via state benefits, debt rescheduling or write off and outstanding pay entitlements for pharmacists and their families, former pharmacists, trainees and MPharm students facing challenging situations. Unfortunately none of us can foresee what lies ahead, nor, in many cases, can we comprehend ever needing support – particularly (in the case of professionals) financial support. For some the thought of reaching out for help with their finances can be a real challenge, as they experience feelings of guilt and ‘failure’. But few of us have ever considered the impact situations such as a relationship breakdown, bereavement or redundancy can have on our situation, never mind ensure we are prepared for it. We tend to live month to month, juggling credit card payments, student debts and large mortgages. But, as a charity, established by pharmacists, for pharmacists, we are here to help in times such as these. Financial assistance is available in the form of debt and benefits advice and in appropriate monetary grants to those eligible for our support. Our process is transparent and fair and decisions, based on individual circumstances and needs, are made within a grants policy framework. We welcome contact from potential applicants wanting to find out more information, request an application form, discuss needs or who require help with the process. Our Grants Officer is available to advise and support and can be contacted by phone or email. Our process is straightforward and all we ask is for an individual to complete a simple application form and share relevant requested information to evidence their financial situation and inability to meet essential living costs. Help with fees associated with or required to be able to undertake the professional role can be considered. Providing relevant supporting information enables prompt decisions to be made. When the required information is received the Grants Officer follows a clear process. Information is considered using agreed national income measures to calculate if a realistic standard of living and a minimum income standard are being met; applications are assessed to make a decision about the best support we can give. This may be a referral to a benefit or debt advisor to ensure individuals are in receipt of their maximum benefit entitlements, help with money management to reduce debts and/or a monetary grant may be awarded. Each of these services can support people to plan a more sustainable financial future. Decisions are shared with individuals as soon as possible once made and a clear explanation given if we are not able to support. For further information on our financial assistance service, click here.